What are the calendar settings? The Settings on a Teamup Calendar are the “control center” for the calendar. To protect calendar security, the Settings are only accessible via an administrator link. Authorized calendar administrators can access the Settings as needed. Other users can be granted calendar access at varying permission levels, from Read-only to full Modify permission, but will not be able to access the Settings. Type /settings to the end of your calendar link in the browser URL bar. General Settings: set admin email, language, toggle certain features on or off, and set various defaults; you can delete the entire calendar if desired. Date & Time: set the time zone, date format, and other time and date options. Calendar Views: set the default calendar view, the calendar resolution, toggle certain calendar views on or off, and set other calendar view options. Identity: set the calendar title and customize the header. Calendars: create, organize, and manage sub-calendars as well as iCalendar feeds. Sharing: create, delete, modify, and manage calendar links. Event Fields: manage or modify built-in event fields including signups and comments, and create custom event field(s). Notifications: create and manage all notification subscriptions (email, Daily Agenda, and Slack). Import Events: import event data from other calendars or calendar services, via iCal or csv format. Export Events: export event data from your Teamup Calendar via iCal or csv format. Subscription: manage your Teamup subscription and see your subscription history. Note that the full calendar Settings are not available on the Teamup mobile apps. 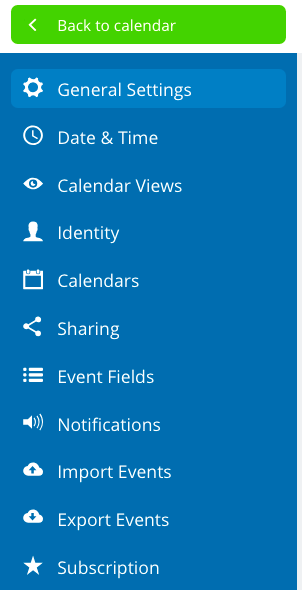 On the Teamup mobile apps, there is a Dashboard to view the calendar links you have added, and a Settings menu. The Settings menu on the mobile apps allows you to adjust the time zone, toggle the option to Display empty days, or Remove calendar from the app. These settings only affect the display or availability of a calendar on the mobile app. « What is a recurring event?